The day I hiked to Rosemarie Meadow was not a particularly strenuous one. It was day eight, so I had already gotten my trail legs. True, I camped the night before near Mono Creek, which meant I had the infamous fifty-two switchbacks, up Bear Ridge, to ascend, but I knocked those off early in the morning while the trail was in the shade. I felt strong all the way up. Not long after I got to the top of the ridge the terrain actually started to descend. When I began to parallel Bear Creek the trail began another ascent, but a gentle one. There was no good reason for me fail to get to my planned camping spot, a couple of miles past Rosemarie Meadow. But, when I trudged into the meadow at around 4:00 p.m., I was totally spent. I knew I needed to stop. As I began to set up camp my head pounded and I was nauseated. I was weak, lethargic and—for the first time on the trail—was not entirely sure I could finish the hike. The idea of abandoning the thru-hike was devastating, which made me feel even worse. Somehow, I had gotten into a vicious circle, spiraling down to place I did NOT want to go. I crawled into the sleeping bag well before sunset, and then, inexplicably, awoke about two hours later feeling great! What a miracle. Except that it wasn’t at all inexplicable or miraculous. I knew exactly what happened. On the switchbacks, that morning, I had encountered a couple of rabbits—and I don’t mean the kind with big, floppy ears. These two young women looked to be in the early twenties, and they were heading the same direction I was, fast. On the way up, we kept passing each other. First, they sped by me. Then, just a few minutes later, I passed them as they took a break on the side of the trail. Later, break over, they zipped by again. Then, apparently one of them decided to re-pack her backpack, because I passed them, again. Here they came a third time, striding past with a friendly, “Hello, again.” Finally, I passed them for the last time as they took a third break, this time sharing what looked like some tasty cheese and crackers. At that point, I was determined to get to the top of the ridge before they passed me again, and I did. In fact, I never saw them again on the trail. Either they passed while I had stepped off the trail for a moment and I hadn’t noticed, or they went elsewhere. Psychology on the trail can be funny; why did I suddenly need to stay ahead of them? I have no idea, but by deciding, early, that I was going to step out fast and make time I somehow “programmed” myself for the rest of the day. I skipped breaks, didn’t eat much at lunch, and decided to wait for a couple of hours in the afternoon to refill my water when I ran out. All of those proved to be very bad ideas. The source of the miraculous recovery, later that evening, was simply the water I drank and the food I ate before going to sleep. It just took my body a couple of hours to absorb the nutrients and liquid. I learned a lesson that day: while hiking the John Muir Trail your body is an engine, and you have to keep it fueled and lubricated, even if you aren’t particularly hungry or thirsty. I think it comes down to a competitive instinct. I also don’t like being passed when hiking but especially when running. On a recent marathon this psychological instinct nearly did me in as my pace in the early miles was too fast leaving me out of gas for the last few. 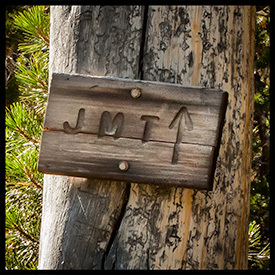 I’ll have to be more disciplined on my JMT hike next year! Agreed! Most of the time that instinct in a good thing, but not always. As a trail runner, when I would compete in races, I always told myself to run your own race. Last August I did the JMT and told myself hike your own hike. This story is a great example of that philosophy. Well put, Lou. Thanks for the comment!